Imperial Tobacco Group plc is a British multinational tobacco company headquartered in Bristol, United Kingdom. It is the world’s fourth-largest cigarette company measured by market share (after Philip Morris International, British American Tobacco and Japan Tobacco), and the world's largest producer of cigars, fine-cut tobacco and tobacco papers. Imperial Tobacco produces over 320 bil cigarettes per year, has 51 factories worldwide and its products are sold in over 160 countries. Its brands include Davidoff, West, Gauloises Blondes, Montecristo, Golden Virginia (the world's largest-selling hand rolling tobacco), Drum (the world's second-largest-selling fine-cut tobacco) and Rizla (the world’s best-selling rolling paper). Imperial Tobacco Czech Republic is a fully owned subsidiary focusing on the Czech Republic's market. 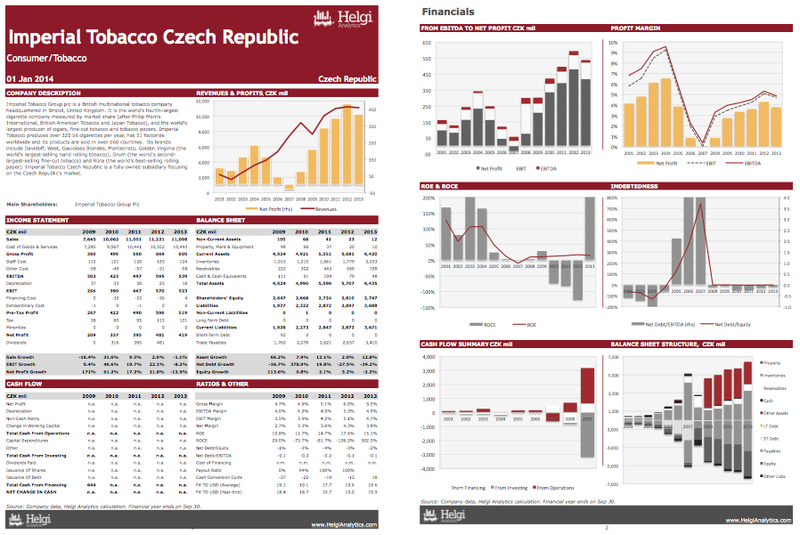 This Annual Statistical Dossier offers a summary of Imperial Tobacco Czech Republic's performance between 2001 and 2017 on an annual basis. The report can be downloaded as an Excel file. This Annual Statistical Dossier offers a comparison of 3 companies from Czech Tobacco from 1993 to 2017 on an annual basis. The report can be downloaded as an Excel file. Imperial Tobacco Group plc is a British multinational tobacco company headquartered in Bristol, United Kingdom. It is the world’s fourth-largest cigarette company measured by market share (after Philip Morris International, British American Tobacco and Japan Tobacco), and the world's largest producer of cigars, fine-cut tobacco and tobacco papers. Imperial Tobacco produces over 320 bil cigarettes per year, has 51 factories worldwide and its products are sold in over 160 countries. Its brands include Davidoff, West, Gauloises Blondes, Montecristo, Golden Virginia (the world's largest-selling hand rolling tobacco), Drum (the world's second-largest-selling fine-cut tobacco) and Rizla (the world’s best-selling rolling paper). Imperial Tobacco Czech Republic is a fully owned subsidiary focusing on the Czech Republic's market. This report offers a summary of the company's performance in 2001-2013. You will find here all the key numbers from the company's balance sheet, income statement and cash flow on the annual basis. Imperial Tobacco Czech Republic's net debt reached CZK -33.4 mil and accounted for -1.35% of equity at the end of 2017. The ratio is up 21.9% when compared to the previous year. Historically, the firm’s net debt to equity reached an all time high of 743% in 2007 and an all time low of -130% in 2003. When compared to EBITDA, net debt amounted to -0.174x at the end of the year. The ratio reached an all time high of 69.8 in 2007 and an all time low of -0.984 in 2003. As far as Imperial Tobacco Czech Republic's peers are concerned, Philip Morris Czech Republic posted net debt to equity of -81.7%x and -1.48x when compared to EBITDA at the end of 2017..
You can see all the company’s data at Imperial Tobacco Czech Republic Profile, or you can download a report on the company in the report section. Imperial Tobacco Czech Republic employed 115 persons in 2017, down 1.71% when compared to the previous year. Historically, the firm's workforce hit an all time high of 202 in 2001 and an all time low of 102 in 2006. Average cost reached USD 3,943 per month per employee per month, 12.5% more than a year ago. This figure was USD 3,989 per month per month some 10 years ago. As far as Imperial Tobacco Czech Republic's peers are concerned, Philip Morris Czech Republic employed some 1,349 people in 2017. Imperial Tobacco Czech Republic's operating cash flow reached CZK 361 mil in 2017, up 112% when compared to the previous year. Historically, the firm’s operating cash flow reached an all time high of CZK 2,527 mil in 2009 and an all time low of CZK -569 mil in 2007. Imperial Tobacco Czech Republic's total investments reached CZK 372 mil and accounted for 0.396% of sales in 2017. This is compared to 0.470% seen on average in the last five years. Since cash from financing amounted to CZK -285 mil, net cash the company generated in 2017 reached CZK 33.4 mil. Imperial Tobacco Czech Republic made a net profit of CZK 147 mil in 2017, down 48.5% when compared to the previous year. Historically, company's net profit reached an all time high of CZK 517 mil in 2015 and an all time low of CZK -29.0 mil in 2007. This implies return on equity of 5.78% and return on invested capital of 5.33% in 2017. That is compared to 13.2% and 91.8% average seen in the last five years. Since 2012, net profit of the firm increased by 104% or nan% a year on average. As far as Imperial Tobacco Czech Republic's peers are concerned, Philip Morris Czech Republic generated ROE of 40.7% and ROCE of 56.3% in 2017.